The KX Yoga 21 day challenge completed! I would say that this word sums up the major benefit for me from the KX Yoga 21 day challenge. With I don’t know how many chaturangas, warrior poses and balances I have done over the past three weeks, I feel stronger in my arms, legs, glutes, core and just my overall body! I also feel stronger in my mind. To hold many of these challenging positions when your body is screaming at you to stop, you definitely develop some serious mental strength too! After practicing on a daily basis, I am more aware of the correct technique required of each posture. There was usually an assistant in many of classes providing adjustments. I can’t reach the perfect alignment yet. But with the knowledge of where I am supposed to get to, it does provide a target to reach. A focus on technique is also important. This is particularly so for newbies and oldies like me, to ensure injury prevention and longevity of practice. By doing the challenge I tried many new classes. This gave me a chance to experience the styles of different yoga teachers. I found this to be a really positive. Firstly, it provided variety to the mat but also new little challenges with the alternative approaches. Yin Yoga focuses heavily on prolonged stretches which really helped with my tight hammies and glutes from running. The Intermediate Flow class was definitely a big step up from the regular Vinyasa Flow class but I loved the new challenges and learning new balances. Nicky’s class will now be a regular addition to my weekly routine post the challenge! As a part of the KX Yoga 21 day challenge, a facebook page was set up. It provided daily communication to participants with motivation and ideas. Featuring each day was a “limb of yoga”. This gave you a specific focus to bring not only to your yoga practice but to your daily life. I found this interesting and useful to focus on an intention. Sometimes in our frantic and busy world, we need small reminders of some of the important things in life. Even though I was unable to make the weekly meetings, information discussed was also shared on this facebook group, including yoga tips, healthy recipes and meditation ideas. 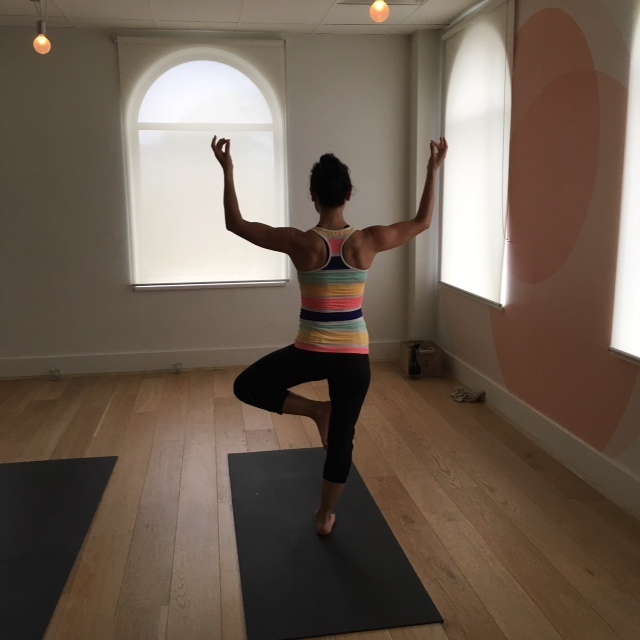 KX Yoga Malvern has a warm and inviting sense of community with its owners and teachers so happy, friendly and genuinely interested in making your experience a special one. I really loved being a part of this Challenge community. I won’t tell a lie, the challenge was exactly that! It took major dedication to get to the mat each day especially when juggling other commitments. Unfortunately, I was not able to get to the once a week meetings in the evenings as I am the designated taxi driver for my girls’ and their training commitments. Despite this, I did manage to get to one yoga session each day, many times the 6am class if there was no other time available during the rest of the day. The physical aspect of daily vinyasa flow practice was definitely exhausting. I am not the sort of person who just turns up and does something half-heartedly either so I did try to maintain the level of activeness in my practice each day. Some of you may think, “how could yoga possibly be exhausting?” There are different types of yoga, from the more meditative style to the active style of vinyasa flow which gets the heart rate up, muscles engaged, core strength active, flexibility stretched, all whilst trying to look graceful and effortless! How do those yoga teachers make everything look so easy? However, I did find that after the first 5 days I was feeling fine and back to my normal self. I think it just took that time for my mind and body to become used to the daily practice. Because of the time commitment that yoga took each day (usually 1 hour 15-minute sessions), I didn’t have time for my usual weekly exercise routines. I only managed to swim once over the 21 days instead of once a week and ran only 1-2 times a week instead of 2-3 times a week. But that’s OK as overall I was definitely working out more than usual anyway and I am not training for an event at the moment. Would I the KX Yoga 21 day challenge again? Yes, absolutely! As a beginner starting earlier this year doing one class a week, the KX Yoga 21-day challenge has brought me around 5 months experience in 3 weeks. I now feel I have gone from beginner status to feeling like I am qualified to now say that I am a regular yogi! I think it is a great way for beginners to really get to know and develop the skills of yoga quickly, but I would also do it again to take me to the next level when I am ready for that challenge. ← Previous Previous post: Orienteering – A running challenge whilst using your brain! Next → Next post: Aurora Spa – a very special treat! This is an amazing commitment to do yoga (or any form of exercise) every day for 3 weeks! Congratulations! I’m hoping to find a yoga practice locally in Mosman (NSW) to give yoga a try in 2016. Thanks! It was definitely worth doing. I hope you find somewhere great to practice too. Many studios have introductory offers so just give them a go and see which one you like. Goodluck and enjoy!